The FINAL FANTASY® XV universe continues to expand as SQUARE ENIX® today revealed an exciting collaboration with Ubisoft Entertainment’s hit Assassin’s Creed® franchise, available as a free download from the Xbox Games Store and PlayStation®Store. The immersive FINAL FANTASY XV: Assassin’s Festival in-game event will run today through January 31, 2018 as Noctis and his comrades take part in a Lestallum festival held in honor of a mythical hero who fought to resist the shackles of oppression. The limited-time event will introduce gameplay elements inspired by the Assassin’s Creed game series, including nimble and acrobatic movements in the field, vicious assassinations from elevated height, and large-scale treasure hunts. There are also exclusive outfits including the Medjay Assassin’s Robes for Noctis and his crew, and the Master Assassin’s Robes for Noctis, the latter which is only obtainable via the Dream Egg from the Moogle Chocobo Carnival. Other in-game collaboration items include the Assassin’s Creed-themed Regalia items (decal and full body decal), along with a themed photo frame and filter that can be applied to and accessorized with Prompto’s photographs. A new trailer showing off the collaboration is available on YouTube: https://youtu.be/Vn6Sy3Xx5Ss. 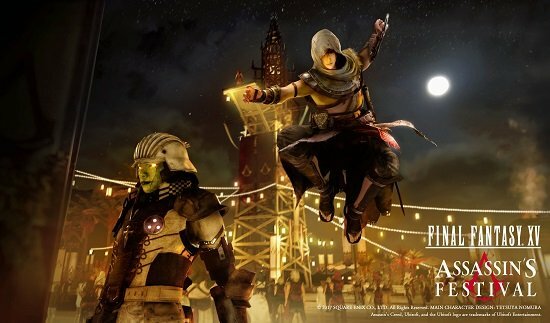 For more information on the FINAL FANTASY XV: Assassin’s Festival, please visit www.finalfantasyxv.com/en/assassins-festival . Noodle Helmet Outfit – this mysterious, famed Nissin Cup Noodle outfit musters up Noctis and his comrades’ energy and remarkably increases their HP recovery rate. Timed Quest Updates – Additional limited-time “Timed Quests” have been added to the quest tracker. Exhibition of Third Snapshot Contest Winning Photos – The winning photos from the third community Snapshot Contest are now on display at Galdin Quay. Bestiary – A gallery where players can see the enemies they have defeated in battle and take an in-depth visual look at the enemy is now available via the menu screen. Chapter Select – Players can now select and play various chapters from the main menu. This feature can only be accessed after completing the game. More information about the game’s update is available on the website: http://sqex.to/CnZ. Square Enix will be showing a video with development updates for Final Fantasy XV at the end of January. Square Enix Ltd., today announced its next Active Time Report, a fully subtitled program that focuses on delivering development updates from the FINAL FANTASY® XV director Hajime Tabata, directly to the SQUARE ENIX community will take place at the end of January 2016. Tabata and Akio Ofuji, the global marketing manager, will be hosting the program as usual. It has been a while since the last FINAL FANTASY XV Active Time Report was broadcast from Tokyo Game Show 2015. The next Active Time Report will be coming at the end of January 2016. In the next ATR (Active Time Report) we’ll be focusing on the Niflheim Empire – the enemies of FINAL FANTASY XV. We plan on showing the latest battle footage including some scenes of magic. We’ll also be sharing further information about the special FINAL FANTASY XV event which will be taking place in March 2016. Full broadcast times will be announced closer to the show. For more information, please check our official FINAL FANTASY XV Twitter account @FFXVEN.